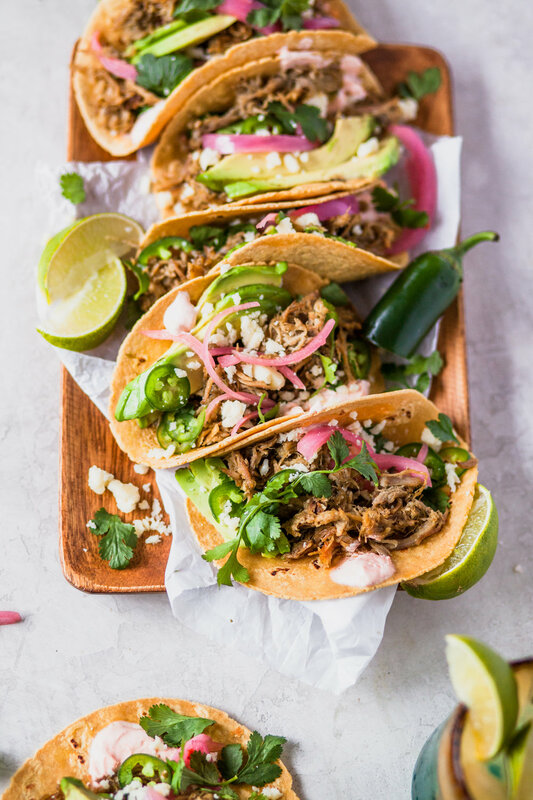 garlic & cilantro shredded pork tacos. i really think i could live on tacos alone. so many possibilities. what’s not to love?!?!! peter is the regular meat chef in this house and he’s really good at marinating & grilling, etc. but i took it upon myself in the new year to learn how to meat mo betta. my usual tricks pretty much consist of thawing out frozen chicken and cooking it in a pan with garlic, salt & pepper. or cooking sausages in a pan. and that is getting oooooold and lame real fast. i’m in love with tieghan gerard’s half-baked harvest cookbook - she has so many delicious looking meat recipes and different methods of preparing meat. i’m just learning everything from her at this point. and it’s working out famously. last week, i made her marinated chicken for gyros and this pulled pork! both meat methods were delish and you could adapt the meats into a lot of different recipes. and the best part is…….learning to meat is super easy. marinating is key…and all that really entails is a little bit of planning ahead and waiting around. you can marinate this pork for just 2 hours at room temperature - i did it overnight in the fridge for about 24 hours and then cooked the pork in the dutch oven for about 4 hours. 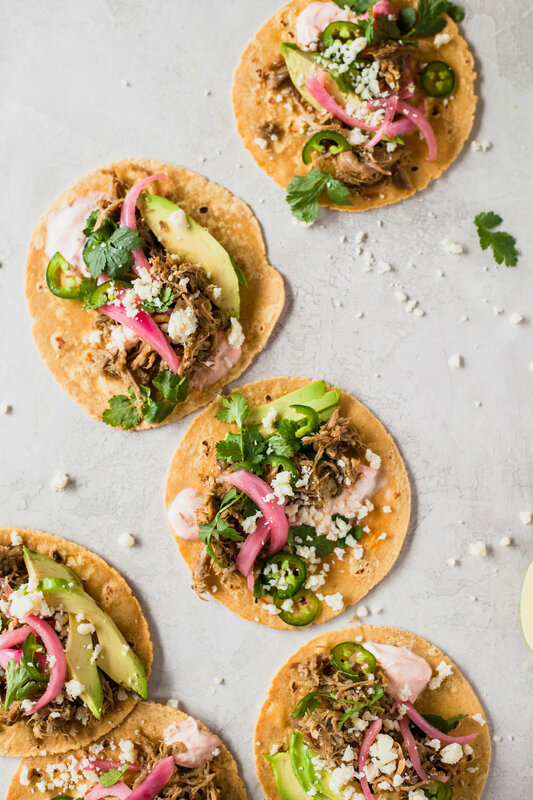 the result is fall-off-the-bone, succulent & super flavorful pork that you can use in tacos, sliders, sandwiches, burrito bowls, on rice…you name it! i just finished eating this pork for about the 6th day in a row and i wasn’t tired of it, which is huge for me! i enjoyed it in different formats to switch it up. these types of tacos are my favorite. after watching salt, fat, acid, heat on netflix, it makes so much sense why certain foods and flavors just taste good. ya got yer salt in the pork and the cotija cheese. ya got yer fat in the pork and avocado. ya got yer acid in the pickled red onion, jalapeño, and lime. ya got yer heat in the hot shredded pork. also, heat in the sense of spiciness from the jalapeño & hot sauce. and i’ll take it one step further and say the cooling effect of the hot sauce + sour cream is also a pleasing flavor experience. aaaaand fresh cilantro to boot. i’m excited to carry on my meat-learnin’ journey and not be afraid of it. one of my goals for 2019 is to make a new type of food or recipe i wouldn’t normally make, each week - i’m doing pretty good so far. it’s sooooo cool when you make a new thing and actually learn something and a new door opens up to wherever….. i remember when i first made tortilla soup in a blender - my mind was blown - but also, i think that should’ve been obvious? it’s funny to reflect back on the littlest things in life that just started to * click * in your brain. you just have to try stuff to figure out that cooking is cool & fun and super liberating once you’ve gotten a bit comfortable in the kitchen. you live you learn…thanks, alanis!! To make the pork marinade, combine the olive oil, garlic and cilantro in a blender and pulse until super finely chopped. Place the raw pork shoulder in a large heavy duty zip-lock freezer bag and pour in the marinade. Seal the bag and set on a plate or in a loaf pan. Marinate the pork for at least 2 hours at room temperature, or in the refrigerator overnight. Begin quick-pickling the red onions a couple hours before you’d like to use them - ideally pickle them for at least 24 hours. Remove the pork from the fridge 30 minutes before roasting. Preheat the oven to 350 degrees F. Place the pork in a Dutch oven and discard the bag of marinade. Add 1 1/2 cups of water (I would also use a light beer for this step). Cover and place in the oven. Roast for 3-4 hours, or until the pork falls off the bone and shreds easily. Don’t let the liquid in the Dutch oven reduce to lower than 1 inch - add 1/2 cup of water if it gets too low. Leave the liquid in the pot and shred the pork completely, discarding any fatty pieces. Toss the shredded pork into the remaining liquid to moisturize. Add about 2 teaspoons of kosher salt and 1 tsp. black pepper and toss to incorporate. Add salt to taste. You could also cook the pork low & slow in a Crock Pot, and transfer to a cast iron pan to crisp the pork before serving. Slice the avocado and jalapeño, wash and chop the cilantro. Mix the sour cream and hot sauce together, or use sour cream + lime. Warm the tortillas on the stove until tender and slightly puffy. 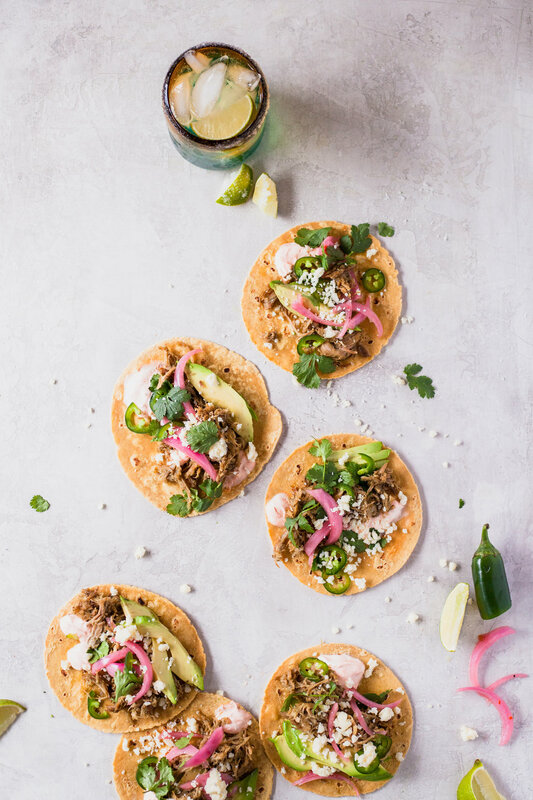 Build your tacos with the hot sauce sour cream, shredded pork, avocado, pickled red onion, cotija cheese crumbles, jalapeño slices and fresh cilantro. Squeeze with lime juice if desired. 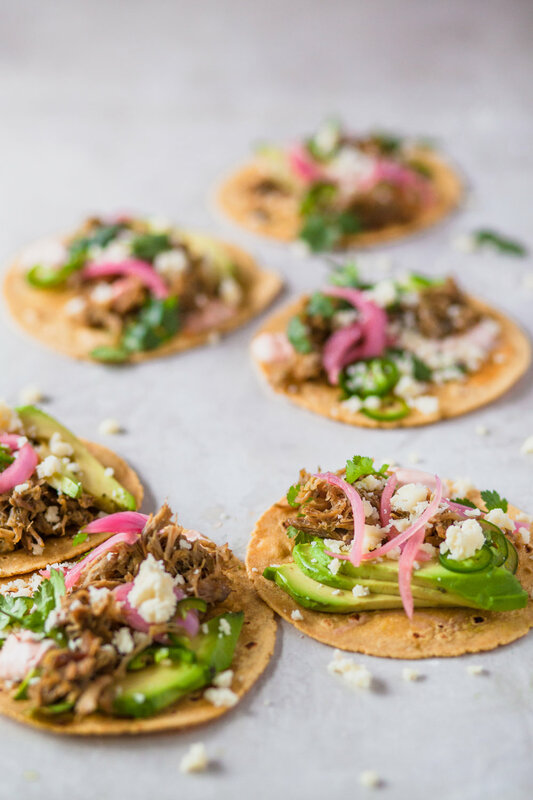 Store the shredded pork in the fridge and reheat as needed. Enjoy the meat within 1 week. 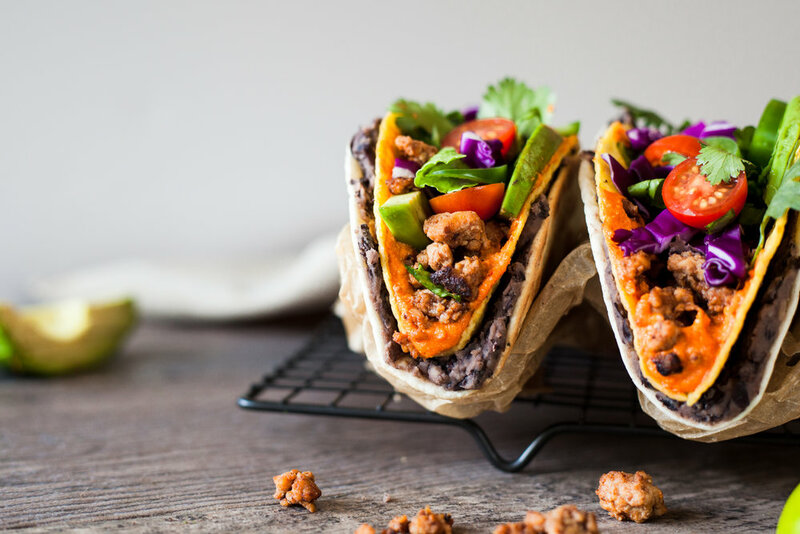 chicken & black bean double decker tacos. double decker tacos bring me right back to half-days or early-outs in high school when everyone would disperse and go get lunch at various fast food joints. my high school was way out in the country boonsville usa, and we had a closed campus for lunch and such. so half-days were the ultimate. what i'm getting at is that double decker tacos at taco bell were my jam. until one said half-day when i had like 3 of them and i don't think i went to taco bell pretty much ever again haha. but as a texture freak, double deckers are genius. a plump & soft flour tortilla hugging a crunchy shell with beans in between! and then all the toppings within! yes please. turns out that brother phil's red pepper cashew sauce is PERFECT on these double deckers. it's so flavorful and creamy, i didn't think adding cheese was even necessary. but pleeez go ahead and add cheese because cheese makes life worth living. i hardly ever buy ground beef unless i have a deep winter's craving for a meaty lasagna or something like that. and i kinda think the light color of ground chicken & turkey is freakydeaky. so i disguised the chicken with the leftover black bean juice and some spices so it was parading as ground beef, lol. looks like it, eh? pete even thought it actually WAS beef. 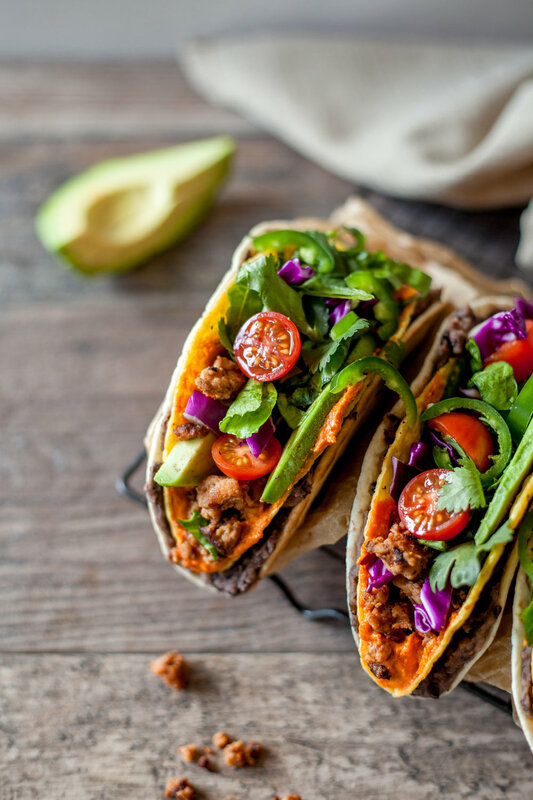 and these are soo much more substantial than you-know-who's double decker tacos and there's a lot more grown-up flavor represented. just one will really satisfy you. get your double decker on this cinco de mayoooooo, amigos! Open the can of black beans and reserve the liquid in a small bowl. Heat a large pan or skillet to medium heat with a drizzle of olive oil. Add the ground chicken and turn to brown and break up into crumbles for a few minutes. Add about 1/2 cup of the black bean liquid, 1 TB minced garlic, salt, pepper, and paprika. Continue to cook the chicken on medium/high heat until it's very browned. In a separate pan, heat the black beans on medium/low. Use a potato masher to smash the warmed beans until they look like refried beans. Add a pinch of salt and mash the beans until very smooth, adding a small amount of water here and there if they need some moisture. Chop and prepare all the veggies and toppings as directed. Warm the flour tortillas on each side on the stovetop. 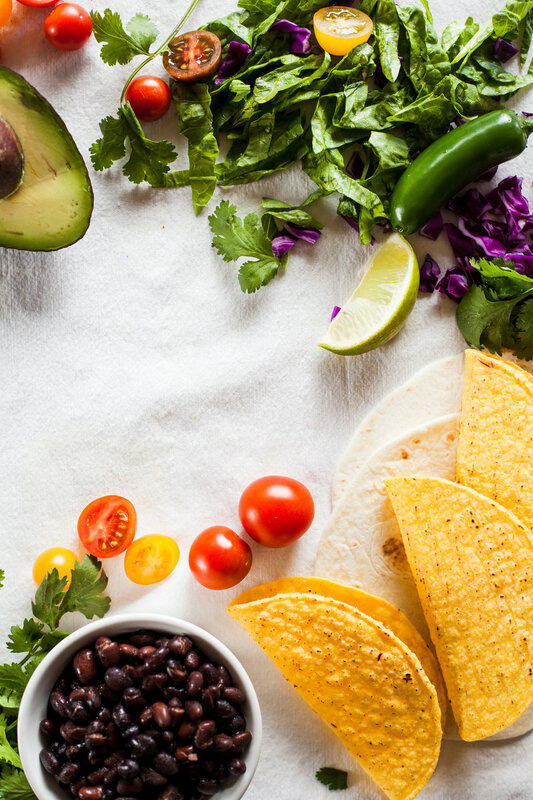 Once all the veggies are prepared, chicken cooked, beans mashed, and tortillas warmed - begin building your double decker tacos. 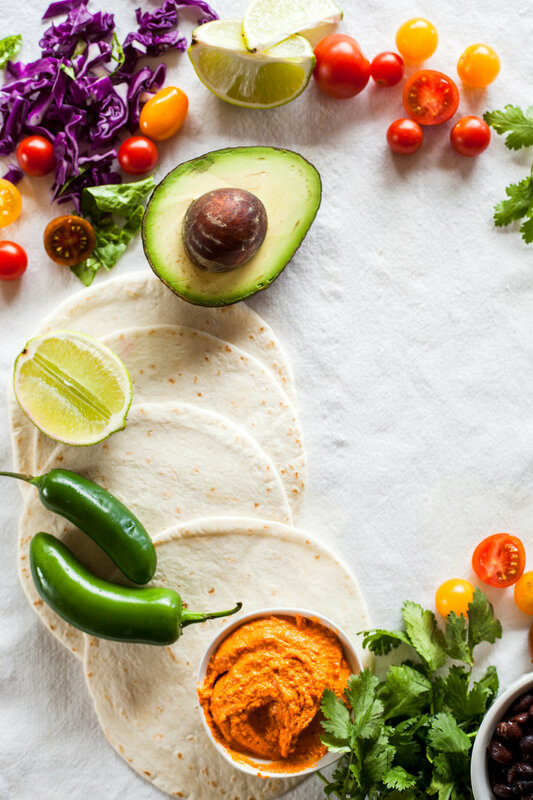 Use a spatula to spread a layer of mashed black beans onto the flour tortillas and wrap the flour tortillas around the hard shells. Add the red pepper cashew sauce and ground chicken on the bottom. 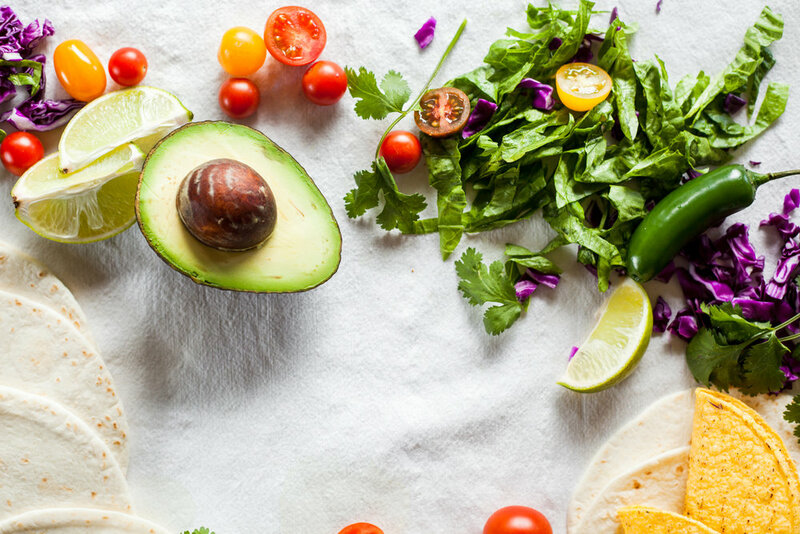 Layer on lettuce, avocado, cabbage, tomatoes, jalapeños & cilantro. Sour cream or plain Greek yogurt would be delicious on top, too! 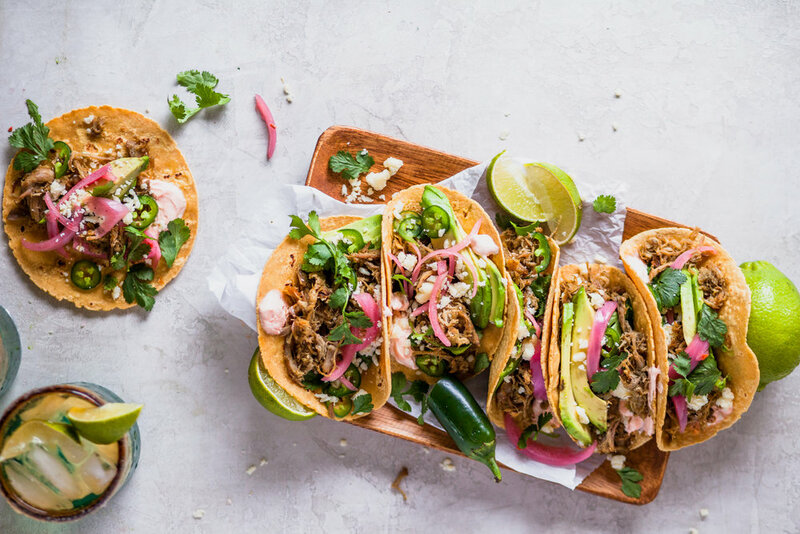 Serve immediately or build each taco as desired. The hard shell will soften quite quickly inside the soft shell.